I was curious, though. Curious, mainly, because of a new fitness craze Pure Barre had started not just in Florida’s own Walton county, but across the nation. Other than hours on the elliptical trainer, I had not stuck with a strict exercise regime since I stopped dancing, and I wanted to know more. Pure Barre was founded by Carrie Rezabek, a professional ballet performer and choreographer who left the field of dance to practice law. While practicing as an attorney, Carrie took personal enjoyment in teaching exercise classes such as Pilates, spinning, and kickboxing. After only two years in the legal profession, Carrie left her job to open her first studio in a suburb of Detroit, Michigan. Years later, Carrie began licensing the Pure Barre technique, and, in 2009, Pure Barre began franchising. There are currently seventy franchised locations in twenty states. According to Ashley, Pure Barre is one of the fastest and most effective workouts to change a woman’s body. It’s a total body workout that uses the ballet barre to perform small, isometric movements to lift the glutes, tone the thighs, flatten the abs, and burn fat in record-breaking time. Rather than creating bulky muscle, a Pure Barre workout strengthens the muscles while simultaneously lengthening them, creating a long, lean physique (normally attributed to dancers). The company goes as far as to guarantee that noticeable differences can be achieved in only ten sessions. With a little prompting from Ashley, I was lured into Pure Barre at WaterColor. I arrived at my first class early on a Saturday well prepared. Pure Barre clients are encouraged to wear pants and keep the midriff covered to help maintain body heat, so I wore yoga pants and a tank. Socks are required to prevent slipping out of a position while in class. If you forget yours, Pure Barre socks are available for purchase along with a full line of athletic apparel—choices include Splits59, Zobha, Mondetta Performance Gear (MPG), Alternative Apparel, Emi-Jay, and the Pure Barre brand. Inside the Pure Barre studio, ballet barres and floor-to-ceiling mirrors stretch the length of the room on each side so that clients can focus on perfecting their technique. Classes are kept small to ensure that personal attention is given to each client. On this particular Saturday, the class was almost at max capacity with twenty students. Equipped with weights, an exercise ball, and a resistance band (all provided by Pure Barre), I padded to the ballet barre ready for a new type of workout. The Pure Barre method is formatted in intervals. After a brisk warm-up to heat up the body’s core and engage the muscles, it was to the barre for thigh work, then the center of the floor to immediately stretch out, back to the barre for glute work, and back to the center to stretch out. The cycle repeated itself, continuing through the core, abdominals, and back, each time stretching and lengthening the muscles after the conditioning sets were complete. After my first class, one thing was clear—this was not the ballet barre conditioning to which I had once been accustomed. Ashley was more than willing, however, to stay after class to answer questions and show me one-on-one how to execute the positions and repetitions that I found especially challenging. Pure Barre is, quite literally, a unique fusion of Pilates, yoga, and ballet barre conditioning—and it’s unlike any workout I’ve ever experienced. Each Pure Barre movement is so tiny that, initially, I wondered how this could change my body at all. But I quickly felt the impact as my muscles began to shake badly from fatigue during many of the exercises. I learned that this is the desired Pure Barre effect: When the muscles shake, it indicates they are reshaping. If they don’t shake, then they aren’t being challenged enough. There’s a term for it: muscle exhaustion. This had somewhat of an empowering effect on me—instead of feeling defeated and that I couldn’t perform, I felt motivated to move my muscles to the point of exhaustion. 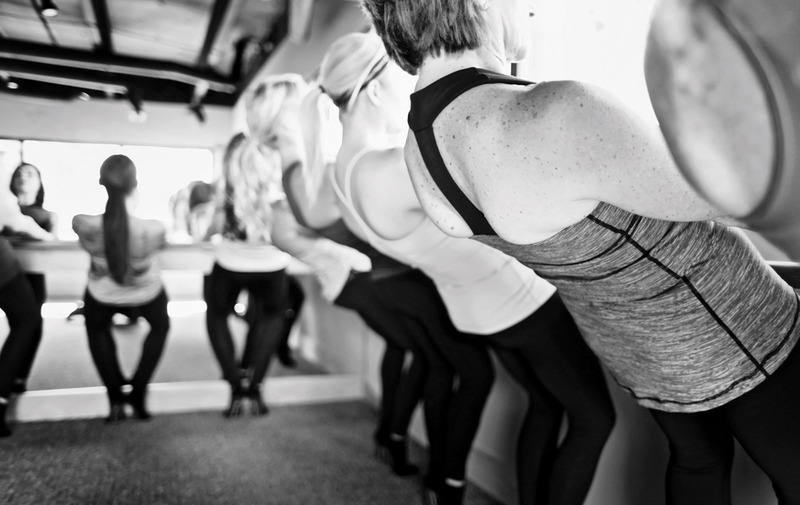 The Pure Barre workout builds upon a technique that ensures the movements are working the muscles to their limit. Each client can adjust to her own individual capabilities—for example, raising the leg a little higher or pulling the resistance band a little tighter. You get one of the best workouts of your life by barely moving a muscle. Almost instantly, I could see results in my flexibility and, for the first time since my ballet days, I could feel my muscles getting stronger in all the right places. Throughout my next few classes, I realized the importance that music and choreography play in enhancing the Pure Barre workout. A continuous flow of exercise is set to music with no downtime in the hour-long period. The playlist’s styles and beats correspond to each type of conditioning. For the challenging segments, the music is loud and motivating. For the stretching segments, the music and lights are lowered, promoting a calming effect similar to a yoga class. The choreography is constantly being changed to keep things fresh and exciting for clients that come often. For this reason, Pure Barre instructors participate in continuing education to ensure that a certain aptitude for the technique is kept. It is this variety that keeps people coming to class sometimes five or six days per week. After a month of Pure Barre, I was hooked. The sense of community among clients and the motivating group atmosphere of the studio are unrivaled—perks I didn’t get when trying out a new workout video at home or logging in time on the elliptical machine. The workout itself is almost therapeutic—a mixture of pushing yourself to your limit to strengthen muscle, then rewarding yourself as you stretch them out. Each day, I found that I had new and unexpected energy. No more leaving the office to collapse on the couch with my dog—no, it was off to the studio for my daily dose of conditioning and stretching. The most appealing aspect of Pure Barre on my beginner’s journey was the focus on technique. Whether beginners or seasoned pros, clients of all skill levels are consistently striving to perfect their technique and push their endurance. I never left class out of breath or exhausted—just motivated, stretched, and feeling strong. As a Pure Barre beginner, I didn’t walk into my first class feeling like a pro. But after one class, I left knowing that I wanted to be one. And after ten classes at Pure Barre, I knew I wouldn’t be stopping anytime soon. But why listen to me? Take the ten-class challenge and see for yourself. I will see you at the barre! For more information, or to find a Pure Barre studio near you, visit purebarre.com. To contact Pure Barre Santa Rosa Beach for more information, e-mail santarosabeach@purebarre.com.